As I said last week we are getting into fall and the foods that are such an enjoyable part of the season! I did make a large batch of chili which will last us for two dinners and a few lunches! It’s so nice to have an extra meal saved in the freezer for a rainy day! I’m sure now that I’m prego (7 weeks and counting!) I’ll really enjoy having those… you know… for the days that you just don’t have the energy to be in the kitchen! So this week I introduced my kiddos and hubby to the dish and they all really enjoyed it! The fake cheese sauce was perfect! I even sauteed some shitake mushrooms up and added that by mine and Brians. The kids hate mushrooms… awww… too bad… more for me!!! 😉 I will be posting the recipe for the cheese sauce to the blog in the next week or two, so stay tuned! But on to our veggies for the week! Zucchini – I added a large zucchini to our chili and it added smoothness and bulk with out changing the flavors. It was super yummy and I even had seconds! I did chop it small so that it would easily cook down. I also saw this recipe for Baked Zucchini Chips and thought it looked interesting. It does have some ingredients that I would have to change, but the idea looks fantastic and seems like it would be a hit around here. I might even make my homemade dairy free ranch dressing for the kiddos to dip into. Tomatos – There is one recipe I have shared yet for this year, but it is FANTASTIC: Vegetable Pie. This is probably one of my all time favorite meals. It was introduced to me by a friend and it has changed my life forever. It is NOT a quick and simple meal. It takes ALL afternoon to prepare, but the effort is WELL worth it. It is also very important to follow each step exactly or it won’t work. I actually haven’t made it this year and I usually make it once each summer when tomatoes and zucchini are plentiful. It uses a lot of diary and since I’m off dairy at the moment I can’t bring myself to slave over the stove making this when I won’t be able to enjoy it! I have made it without the crust before or have used a gluten free crust and it does turn out well, although not nearly as delicious as the original! PLEASE let me know if you put the effort into this. I’d love to know if it changes your life like it has changed mine! Butternut Squash – I was hoping and waiting to get one of these! When they sell them in the grocery by the pound they are WAY to pricey! It’s crazy how much they can charge! 😉 I’m SO glad to have one now! I’m planning on making a simple roasted butternut squash soup and then have a buffet of ingredients the kids can add to the soup base once they are served at the table. Some of the options might include black beans, grilled chicken pieces, cheese or non-dairy cheese, fresh salsa, tortilla chips, fresh basil, or anything else that sounds good! This will be on our menu for this coming week and will probably be posted to the blog in the next few weeks as well! Acorn Squash – I grew up not liking this, but I’m not really sure why! My sister prepares these by cutting them in half and in the center hole where the seeds were she adds some butter and maple syrup and bakes them til they are tender! I LOVE it this way and it almost tastes like dessert! I’ve also made pumpkin pie before with acorn squash and it isn’t quite the same, but it works! Potatoes – Even though we definitely prefer sweet potatoes, it’s been fun having white potatoes and its changed some of our meals lately! Last week Brian made baked french fries and then made a curry coconut gravy to pour over top and topped with some grilled pork and cheese (or non-dairy cheese for those who needed it). It was SO good and I had a LARGE second serving! I think that may be one of our new frequently visited meals through the winter! Simple and so good! I could almost count it as a comfort food! Peppers, red and green – We will probably eat all of ours fresh again. But I also added 2 or 3 to the chili as well. I may make a roasted red pepper soup which I like a lot, but the kids never like it each time I make it. They usually eat most of what I prepare, but this they won’t eat at all, so I try not to make it too often. I know it isn’t a huge hit with Brian either. But maybe you will have better luck with your family! Apples – We LOVE these! Xanthie ate a HUGE apple this afternoon all by herself… including the core! These apples truly are like candy! And my kids constantly ask for them… more than candy… maybe because they know they are more likely to get me to say yes to an apple than candy! 😉 Anyway… I also have a dessert recipe that takes a little time, but is really good and worth it! It does taste a lot like apple pie, but in my opinion so much better! 😉 Check out cazuela baked apples! So there you have it! Another week! the summer is quickly drawing to a close, but thankfully we have yet a few more weeks of fresh veggies! 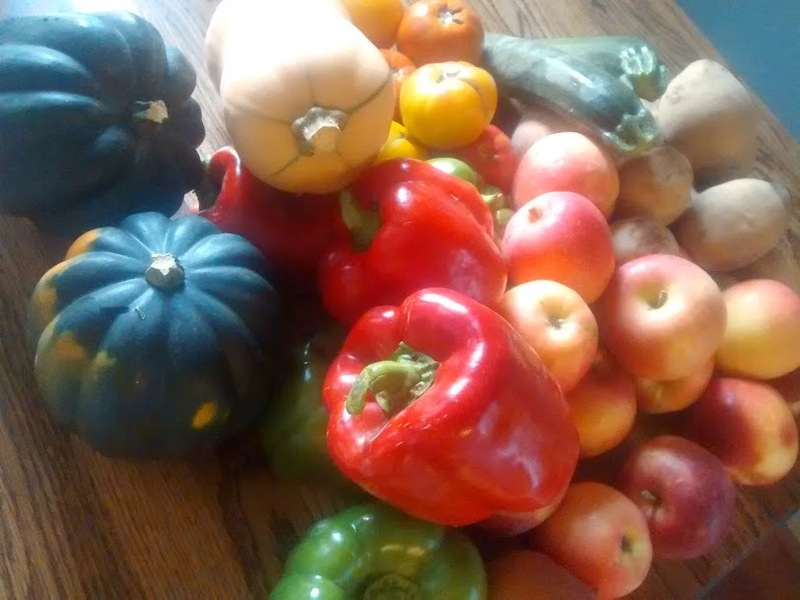 Remember to sign up for the winter CSA if you are interested. The farmer does think it’s going to fill up as he does only have a limited number of orders available! We hope to see you again all winter long!